Got a pretty great granddaughter? Tell her she's cute and amazing with this adorable birthday card! When you send a special birthday card, people feel cherished and loved. It's easy to send, and fun too! Your granddaughter will really love these sweet, sleeping puppies and feel like a million bucks knowing you are thinking of her. So go ahead, and send her a fun birthday message today. Granddaughters are oh-so-sweet! In this digital age, your granddaughter will love getting a very special birthday card from her grandparents! 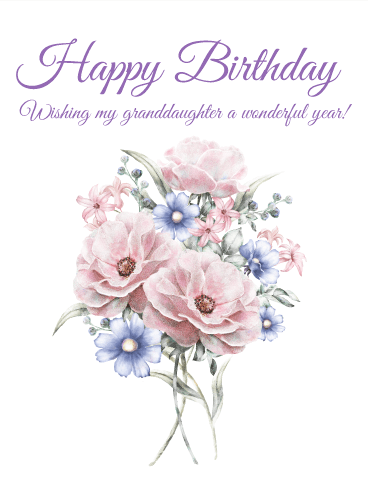 Wish your granddaughter a wonderful day with this thoughtful and pretty birthday card. Butterflies and hearts deliver a cheerful birthday message. It's a simple and fun way to let your granddaughter know how much you love her on her birthday. Is there any better way to wish your granddaughter a happy birthday than with a snoozing dog?! We think not! 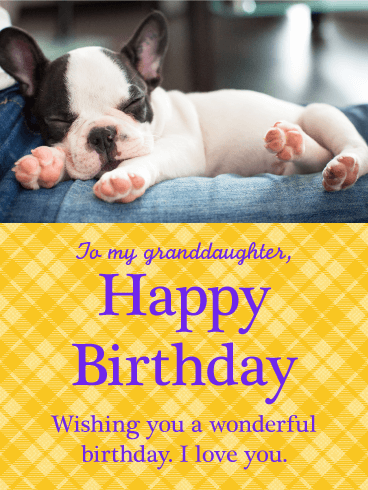 The colors of this birthday card add an element of fun, while the picture of the pup will leave your granddaughter wishing she had time for a birthday nap. This one is a great choice for the granddaughter in your life celebrating her special day! 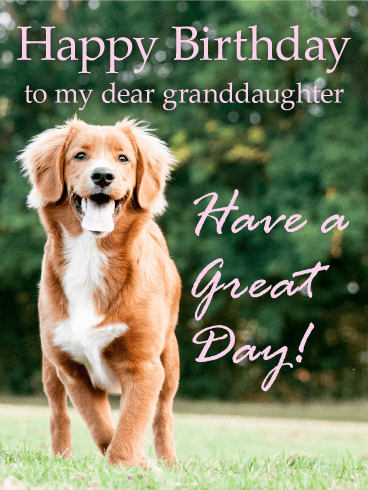 Nothing will bring a smile to your granddaughter's face faster than this adorable card! Just take a look at that sweet puppy! This birthday card is tons of fun and also offers a sweet sentiment. The variety of colors makes it stand out amongst other birthday cards, making it the perfect choice for your granddaughter on her special day! 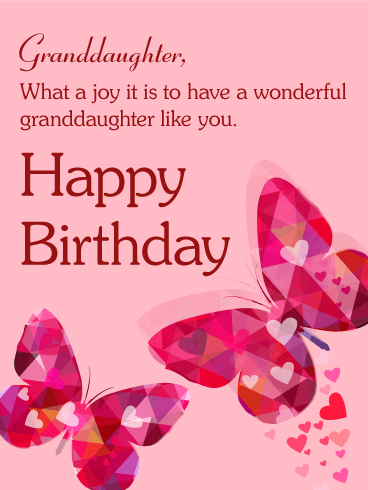 Wish your granddaughter a wonderful year with this beautiful birthday card. Send her something delicate, sweet, and pretty to remind her how precious she is to you. Birthdays come but once a year. 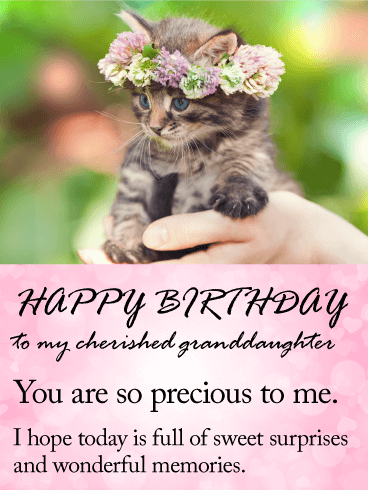 Make the most of your granddaughter's birthday and send this gorgeous birthday card to brighten her day and bring a smile to her lips. She'll appreciate the thoughtfulness and the kind words. A gorgeous birthday card for a very special granddaughter! Wish your granddaughter happiness and love in the coming year. Make it a memorable birthday and send a pretty birthday card to your granddaughter that she won't soon forget. This birthday card is fresh and fun, and one-of-a-kind. It's sure to add some happiness and joy to her special day, and you'll feel great knowing you've made her day a little more special. Wishing your granddaughter a happy birthday has never been easier, or more fun! Our birthday cards are clever, sweet, and pretty-just like your amazing granddaughter! 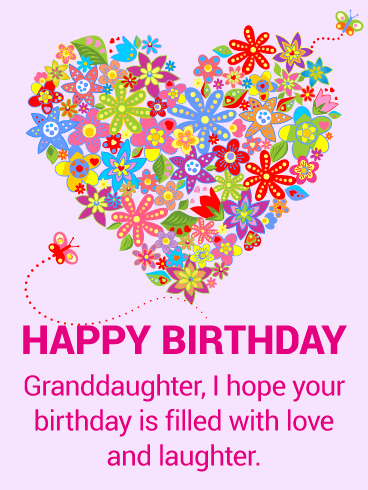 Send a birthday card to your granddaughter and wish her a day full of love and laughter. Birthdays are for fun and surprises. Nothing will surprise your granddaughter more than a festive birthday message in her inbox! This birthday blessing is a beautiful way to wish your granddaughter a wonderful year. The sweet words will touch her heart, and the birthday card is just charming. It's a delightful birthday card perfect for a granddaughter who's dear to your heart. It's not always easy to say how much we care, but it's always a good idea to try. With a thoughtful birthday card, you can truly express yourself and share your love, from near or far, with your granddaughter. If you and your granddaughter are always joking around, this is the birthday card for you! It's good to keep the grandkids on their toes and tease them every now and then! Everyone loves it when their grandparents get sassy! This birthday card will make your granddaughter laugh and roll her eyes. Remind her that you're more on your game than she thought. This funny birthday card is perfect for adding a bit of humor and silliness into your granddaughter's day. Birthdays are for games and cake! Let your granddaughter know you hope she does all her favorite things today with an adorable birthday card. It's easy and fast to send your granddaughter a birthday card and it will make her day extra fun, and super special. She'll love the cute picture, fun colors, and awesome message all made just for here! Tender and loving, that's what granddaughters are. Your granddaughter is cherished and adored. She is a precious gift and her birthday is the perfect day to honor her life. Send a pretty, little birthday card to wish your granddaughter a very happy birthday full of sweet surprises and wonderful memories. Make it a birthday to remember with this sweet and sentimental birthday card for your granddaughter. Granddaughters' make it easy to love them. They are so silly and special, so thoughtful and sweet. 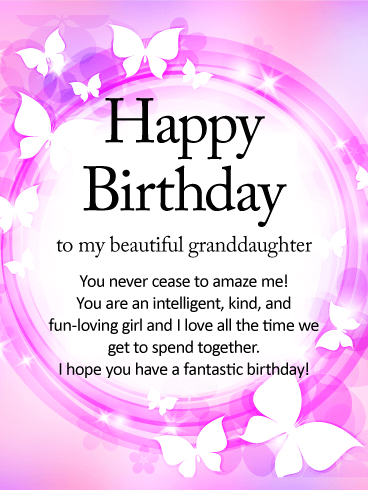 Send your granddaughter a terrific birthday message that she will love! 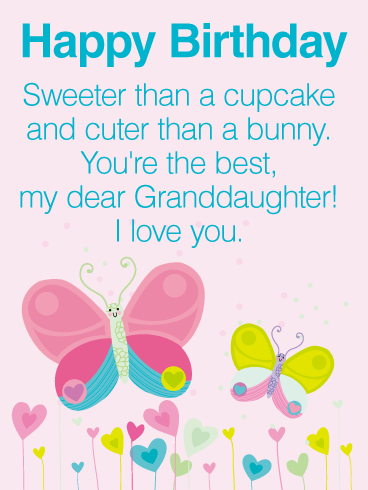 This cute birthday card says it all and wishes your granddaughter the best birthday yet. 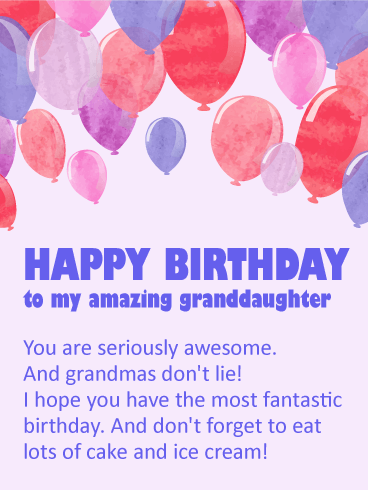 Tell your granddaughter how fun she is with this awesome birthday card that you can easily send today! Granddaughters grow up too fast! Make sure you send a special birthday card to your granddaughter. 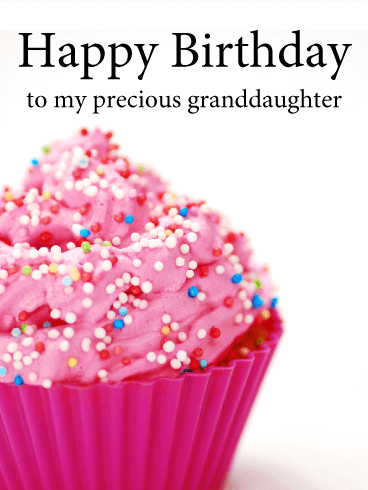 This wonderful birthday card is bright and shining-just like your precious granddaughter. 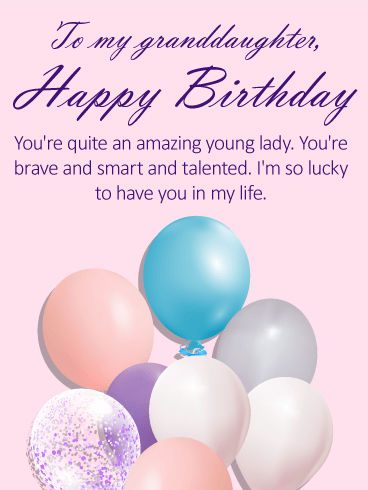 Let her know how dear she is to you, and that you are always thinking of her by sending this dazzling and fun birthday greeting card. Granddaughters are one of life's most precious gifts. They are a source of joy and pride. 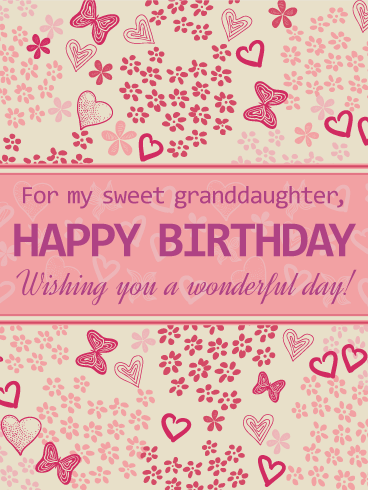 Why not take a moment to send your granddaughter beautiful birthday card? 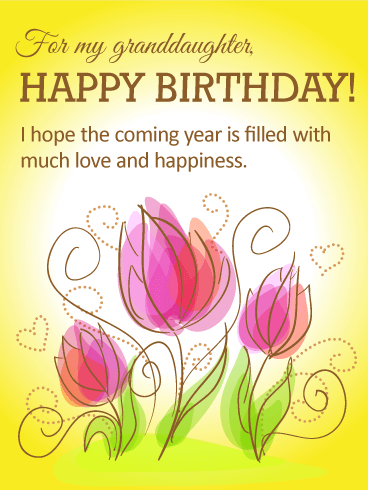 Wish her a happy birthday with a sweet and tender birthday card that will brighten her day. Near or far, it's easy to send a little love to your granddaughter on her special day. For a grown-up granddaughter, this birthday message is just perfect. If you are so proud of the woman your granddaughter has become, make sure to let her know. This special birthday message is sweet, sincere, and thoughtful for a dear granddaughter on her birthday. Send a lovely birthday card to your granddaughter. It only takes a minute, and will bring her so much happiness. This one is for seriously awesome granddaughters only! Is your granddaughter really something else? Does she amaze you with her soccer skills, her ballet moves, or her watercolor art? On her birthday, wish your granddaughter a fantastic day and let her know you think she's great! 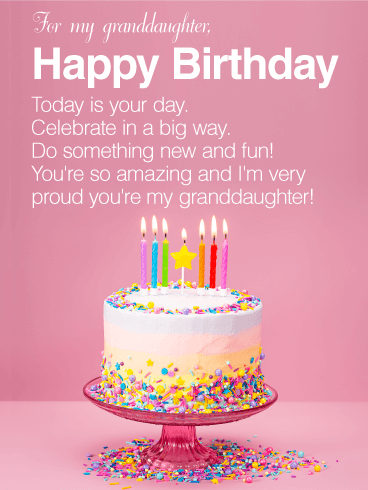 This colorful and fun birthday card has a great message to share with a special granddaughter on her birthday. It's easy to send, and we guarantee it will make her smile. Every granddaughter is unique and special. On your granddaughter's birthday, let her know she's one-of-a-kind. She'll love knowing that you are thinking of her. This festive birthday card is perfect for a spunky granddaughter. 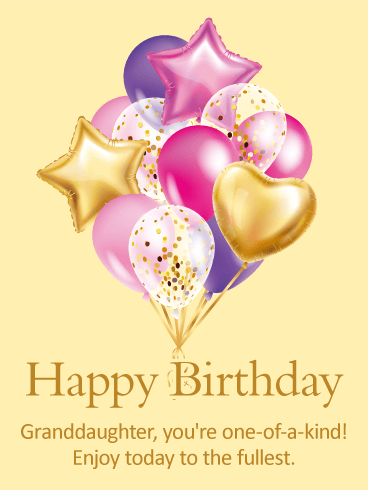 Send a fun birthday card to your granddaughter to help her enjoy her special day to the fullest! 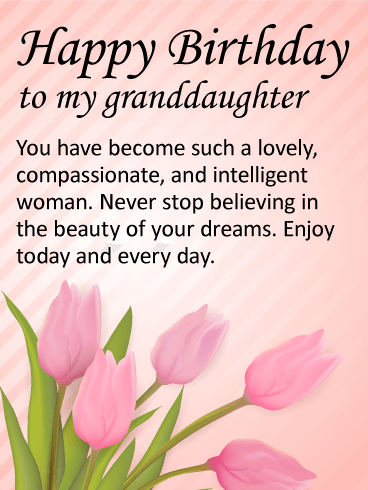 Wish your granddaughter a happy birthday with an easy to send birthday card. Granddaughters are amazing young ladies. They bring so much joy and love into their grandparents' lives. 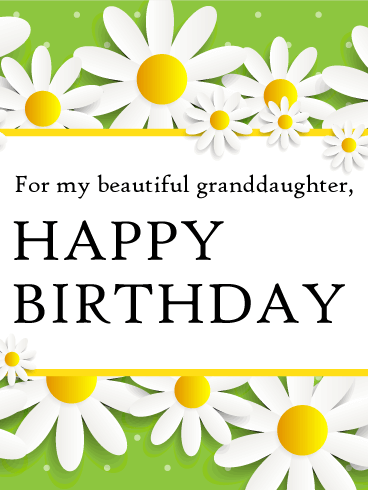 Wish your granddaughter a most beautiful birthday with a thoughtful and pretty birthday card. Let your granddaughter know she is brave, smart, and talented. The encouragement and love will mean the world to her. It is simple and easy to send. Your granddaughter's birthday is a great day to celebrate all of her accomplishments, and to let her know how proud you are of her. 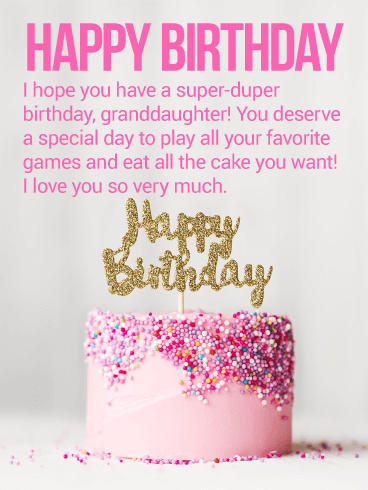 A little birthday poem for your sweet granddaughter! 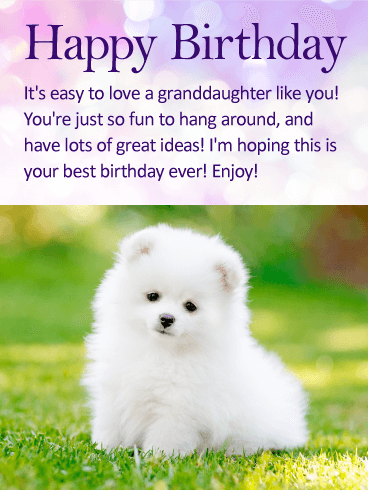 Wish your little granddaughter a wonderful birthday with this adorable birthday message. A charming birthday card for a young granddaughter is a great way to send her love if you're far away. This special birthday card will charm and delight her on her birthday. Send one today. It's fast and easy, and it's super cute! Cute, like you're granddaughter! Every little girl loves a big, bright, beautiful birthday cake. 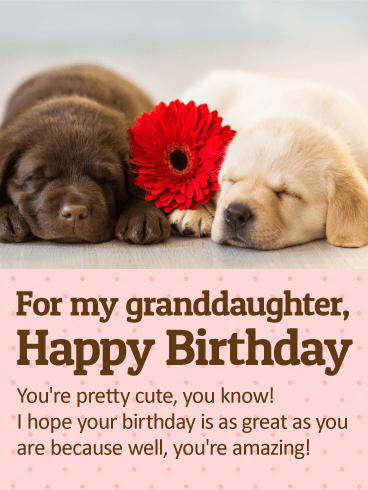 This birthday card will make your granddaughter's eyes pop with glee! 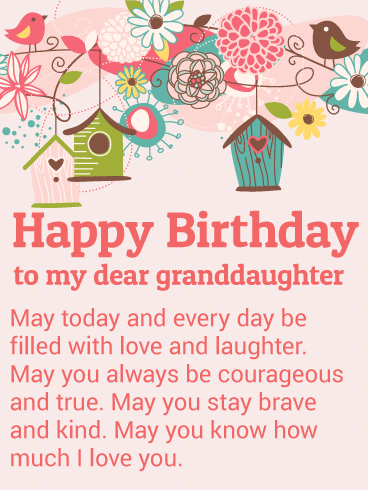 Send your granddaughter a very happy birthday message that lets her know how proud you are of her. Tell her to enjoy her special day and celebrate by doing something new and fun. She'll love this awesome birthday card-it almost looks good enough to eat! Frost the cupcakes and light the candles! It's your granddaughter's birthday and she's ready to celebrate! Are you? You can be with a ready-made, easy to send, and super adorable birthday card! A birthday card lets you spread the love from near or far with your precious granddaughter on her birthday. Wow her with this dazzling birthday card today! A granddaughter is a special gift, so a birthday is the perfect time to let her know how much you care! Something sweet and something pink for the special granddaughter in your life! 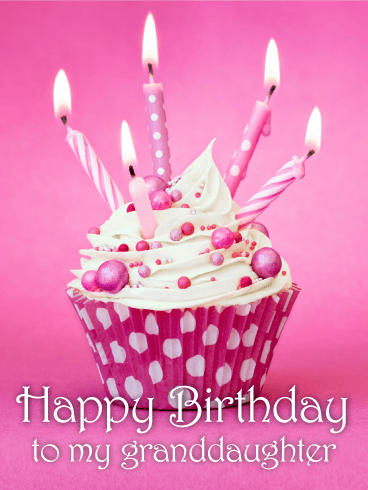 Share a cupcake birthday card that will delight her heart. Sprinkled with love, this delightful birthday card is great for a granddaughter of any age! It even looks good enough to eat! 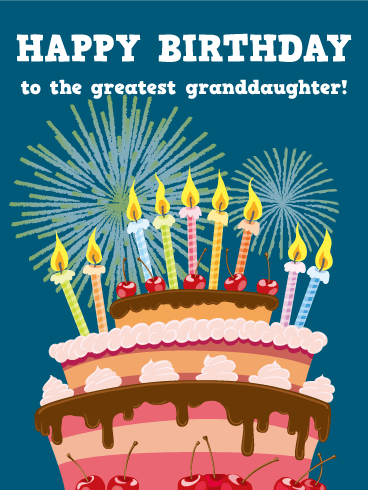 If you are proud of your granddaughter, this birthday card is for you! Celebrate your awesome grandkid with a triple‐decker birthday cake bursting with candles. A party should be festive and fun, and this birthday card captures just that with its tasty swirls of frosting, ruby red cherries and bursts of fireworks. Your granddaughter is the best. Let her know with this awesome birthday greeting! Daises are fresh and fun - Just like your granddaughter! Send her a birthday card full of sunshine with this carefree, daisy, birthday card. 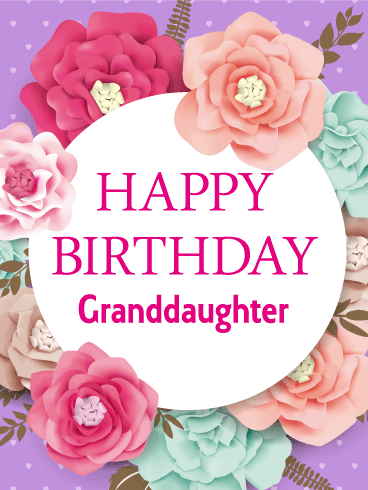 Full of happy summer fun, and the beauty of a simple and sweet flower, your granddaughter will feel loved on her special day when you send this birthday greeting. Your granddaughter will smile when her inbox fills up with birthday daisies. 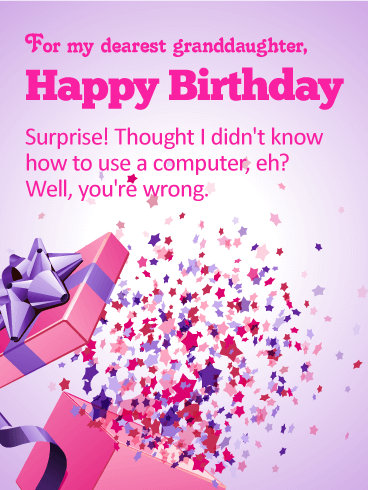 So kick off your shoes, do a cartwheel, and send this happy birthday card now. Beautiful pansies, lilies and hydrangea burst into bloom in this birthday bouquet! Your granddaughter may not be able to smell the sweet fragrance of this beautiful bouquet, but she will certainly feel the love! 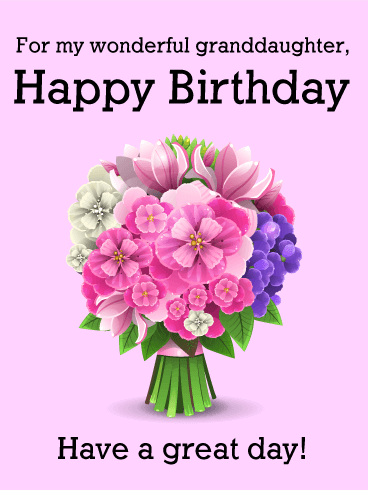 Fill her inbox with a gorgeous array of pink and purple blooms and wish her a very happy birthday. She will be smiling all day long, and so will you! Kaleidoscope butterflies rain down hearts in this special birthday card. Butterflies remind us to spread our wings and fly free and high. They are a symbol of both transformation and beauty. The perfect wish for a wonderful birthday! Your granddaughter is sure to love this beautiful, pink, butterfly birthday card. Let her know what a joy she is to your heart and send a birthday message now.